The following link is to the map and directions for Hacienda Park in La Habra Heights, CA which is the site of many of our meetings and events. 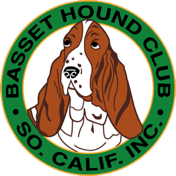 The Basset Hound Club of Southern California, Inc. holds monthly meetings for our membership. They are held in locations through out Southern California which may even include dog shows. We welcome all members and guests to attend our meetings. Each meeting will be listed on this page and in Basset Tales as soon as date, location and time are decided on. Sunday, January 13 - The meeting will be held following the judging of basset hounds at show held at the Industry Hills Expo Center, 16200 Temple Ave., City of Industry. The webmaster was not given any details on this meeting other than there will be a discussion regarding the upcoming BHCSC/BHCA Specialty Show Weekend. Sunday, February 17 - The meeting will be held at the home of Candis and Rob Holman. The club will be offering teeth cleaning for your basset hound as we've done in the past (LINK to more information). Part of the fee will be donated to the BHCSC Basset Hound Relief Fund. No additional details have been given to the webmaster. Call Candy to make an appointment for the teeth cleaning.